TASH RABAT, KYRGYZSTAN — The temperatures dipped to below freezing last night, but it was nice and warm inside the yurt at Baish’s camp. The night had been windy on the edge of the lake and I was up at first light, walking along the waters edge while even the animals were still asleep. Slowly the jailoo came to life as the sun rose over the mountains. The horses and cows began to stir. The sheep and goats started grazing in a slow wave of mass movement across the golden grass. It was a timeless scene of Kyrgyz life conducted in harmony with the natural world. The rhythm of the seasons defined time. And the cold night was an indicator that winter was on the way. Some of the herders had already packed up their yurts and left their summer pastures here for lower elevations elsewhere. Baish’s family would leave in the next week or so. The skies this morning were still turbulent and it was hard to know if the sun would warm the air or hide behind the clouds. I learned from the family that the bridge over the Naryn river that I was supposed to cross on my way to Tash Rabat was still washed out. It would be impossible to take the planned route south west. I would have to go via the town of Naryn, picking up a paved road for a long segment of the drive. Looking at the map it was going to be a much longer route than the one I had planned, and I realized I had better get an earlier start than I did yesterday. I highlighted the new routes on my map but didn’t bother with measuring distances as it looked pretty clear on paper — there was one road that led to the tar road and the tar road from Naryn would go to the point where I took the turn for the old caravanserai for the last segment. For the second half of the drive I was basically doing the back bearing of my original plan for the Tash Rabat to Naryn leg, so it was only the first half of the day’s drive that would be completely improvised. It was still cold and I was wearing my winter hat when I left the shore of Song Kul following the edge of the lake. I soon caught up to a local’s truck and fell in line behind them, following the road and marveling at the incredible beauty of the lake and the high mountains on its other side. I didn’t give it a thought when the truck turned at a fork in the road, and I continued behind for a little bit before realizing that I was now heading north along the contour of the lake instead of south-east. I had just assumed the people were going to Naryn, the nearest major town in the area. I stopped to look at the map. I did some rough measurements to get a fix on my position, then backtracked to where the fork in the road was. The other “road” was a much less used set of tracks and it was counter-intuitive that it could be the way to Naryn. Still, the compass indicated that it went roughly south-east, and the other road was definitely going north. I oriented the map to the ground for more precision, and that indicated clearly that the less-used track was the one I should take, so I set off tentatively alone on an empty two track that seemed to be heading back into the hills. He nodded, “Da” in the affirmative, then gestured and asked, “cigarette?” Unfortunately I don’t smoke and had no cigarettes (I remembered then that I used to carry a carton of Marlboros to give out for just such occasions, but that was a long time ago and I had gotten out of the habit traveling in the US). He didn’t seem to mind, and pantomimed that he had to hurry, and took off down the road cutting back over the hills in the direction of Naryn. I was all alone in the vastness again, but I now felt more confident about where I was going and so picked up the pace. A little further the road turned again and behind the hills there were mountains. Big Mountains in the distance. I stopped to photograph the layers of mountains that seemed endless, and that is when I noticed the men. There were a few of them. Some on horseback and some on foot. And they were standing on the edge of a precipice. It seemed odd. But then how would I know what is normal or not for here. I turned to begin a descent along a set of switchbacks, and then I understood. There were animals easing their way down a steep cliff face. The men were the herders directing the operation. There were cows, sheep, goats and horses. Hundreds of them. Looking down as far as I could see, they were moving in concert down the cliff, each small group guided by at least one herder. The men were working together to get their animals down safely. It looked like a daunting and dangerous task. I stopped mid-switchback to let them pass unhindered (and took the opportunity to make some photos of the scene). When the last of them had gone over the edge, I waited a bit, then continued my route down the switchbacks. I quickly caught up with them again after another turn. It seemed that even at the slowest speed I was going I was still going faster than the herds could negotiate the terrain. I resigned myself to a slow gradual descent with lots of photo pauses and in fact it turned out to be well worth the time to see such an incredible spectacle. I imagined it to be something akin to the great cattle drives of the old west on the American frontier. An epic Cecile B DeMille film scene. As we slowly descended together a few of the herders warmed up to me, even posing for pictures briefly once the animals were down to a safe location. I felt lucky to have come across this moment, and I was suddenly not unhappy about the washed out bridge and the change in my route. Being part of this mass movement of herds that marks the season as the people move from the summer pastures at high elevations down to winter pastures in the valley below was an amazing stroke of good luck. However, I was losing a lot of time, and once we reached the bottom of the cliff I picked up my pace and moved ahead passing the herds where I could. The mass movement of men and animals was spread out over miles and miles, concentrating on the road and blocking the way in spots where the only crossings were narrow sections of “road” then spreading back out onto the grasslands once the passages widened again. In addition all the up and down and around of the “road” down the mountains was represented on the map as a rather “straight” line, so the true mileage was much greater than what I had estimated from a quick line measuring of the map. I still had a long way to go before I would reach pavement and the town of Naryn. I used the maps to identify a few waypoints, where there were intersecting “roads” and I needed to be sure to take the right direction. The road went up over another mountain pass before finally descending once more to the point where I could see the paved road in the distance. I had surely passed thousands of animals on my way and I wondered briefly where they were all going to. One of the herders had tried to tell me, but I couldn’t understand what he was saying. One thing that was pretty sure was that they were not bringing the animals to Naryn, which is a fairly large urban center. When I reached pavement, the road turned out to be a very modern expressway, and I picked up my speed, but tried to stay vigilant for the police, as so far every westerner I had met had gotten stopped and ticketed. Naryn itself was just a little further down the expressway, and then I had to navigate the local streets without a map and attempt to find the route that I had traced to Tash Rabat. The town traffic was chaotic — though no where near as bad as Bishkek — and I ended up circling around a bit looking for the way out. I was burning daylight and had no idea how much longer the drive would be or on what kind of road. I considered briefly the idea of just staying the night in Naryn and going to Tash Rabat in the morning, or maybe even not going there at all. 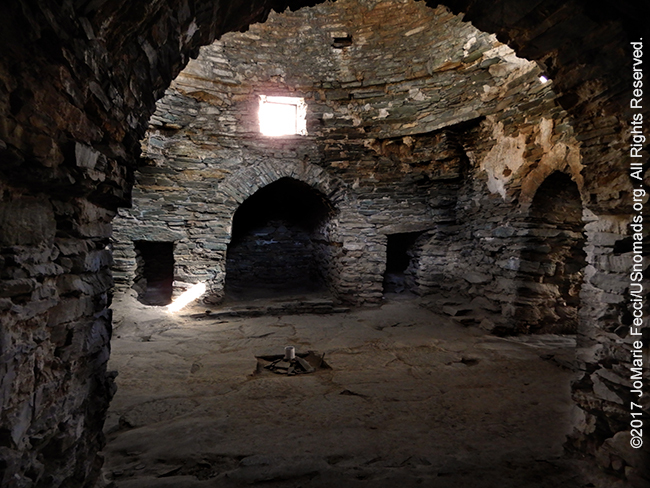 But the ancient caravanserai was kind of the “destination” for this whole trip in a sense. It was the one historic artifact of the ancient Silk Road that was tangible and accessible, and so I decided to try to make it — even if I might have to do the last part in darkness. Once committed to getting to Tash Rabat, I found the way out of Naryn and took off with rally intensity, resisting any desire to stop en route for photos until I had made it all the way to the turnoff back on to dirt and the very last leg of the drive. The focus and determination succeeded in making me quicker, and I had some time before sunset so I took a few minutes here and there to get make some photos on the final approach to the caravanserai, then decided to stop at the yurt camp and leave a visit to the site itself for morning. The skies were grey and overcast, and there was not any real sunset. It had gotten quite cold, and I was very glad when Sabyrbek came by to help me get my fire going inside the yurt.